Background: The plethora of biomarkers available for the diagnosis and prognostication of gliomas has refined the classification of gliomas. The new World Health Organization (WHO) 2016 classification integrates the phenotypic and genotyping features for a more robust diagnosis. 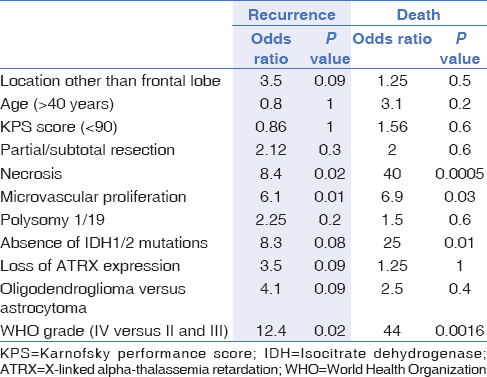 Materials and Methods: Fifty gliomas with oligodendroglial morphology according to the WHO 2007 classification were analyzed for isocitrate dehydrogenase 1 and 2 (IDH1/2) mutations by polymerase chain reaction, 1p/19q status by fluorescent in situ hybridization (FISH), and IDH1 and X-linked alpha-thalassemia retardation (ATRX) expression by immunohistochemistry. Tumors were reclassified into oligodendrogliomas, astrocytomas, and glioblastomas (GBMs) according to the new “integrated” diagnostic approach. Results: 30% of previously diagnosed oligodendrogliomas and almost 90% of oligoastrocytomas were reclassified as astrocytomas. Twenty gliomas showed 1p/19q co-deletion, while 18 gliomas showed polysomy of chromosome 1/19. Polysomy of chromosome 1/19 was significantly associated with astrocytic tumors (P ≤ 0.001). Loss of ATRX expression was seen in 20 of 23 WHO grade II/III astrocytomas and 3 of 7 GBMs. All WHO grade II and III gliomas in our cohort showed IDH1/2 mutations. Moreover, 4 of 7 GBMs showed the wild-type IDH1/2 mutation, and 2 of 3 GBMs which showed IDH1/2 mutations were secondary GBMs. There was no significant difference in progression-free and overall survival between WHO grade II and III gliomas, possibly because all these tumors showed IDH1/2 mutations. In multivariate analysis, only the WHO grade (grade IV versus II and III combined) was significantly associated with increased risk of recurrence and death (P = 0.016 and 0.02). Conclusion: The new integrated diagnosis provides a more meaningful classification, removing the considerable subjectivity that existed previously. Key Message: This study, though small, reiterates the robustness of immunohistochemistry for detection of isocitrate dehydrogenase (IDH) 1 mutations. The findings in this study support the use of the new guidelines provided by the World Health Organisation. IDH1/IDH2 sequencing is recommended for IDH1 immunonegative cases. There are very few studies from India which have looked at the new molecular classification. One such study from India by Rajmohan et al., classified 91 anaplastic gliomas based on the “integrated” diagnostic approach and found that these “histomolecular” subgroups had significant prognostic value, superior to the WHO 2007 histological classification. The objective of our study was to reclassify 50 tumors with an oligodendroglial morphology according to the newly proposed algorithm by Reuss et al., using IDH1/2 mutation status, ATRX expression, and 1p/19q co-deletion and to correlate these with clinicopathological variables and measures of outcome. This was a retrospective study from a tertiary care center in South India in which 50 surgically resected cases of tumors with oligodendroglial morphology from January 2009 to January 2012 were studied. Only cases with the clinical follow up details and snap frozen fresh tumor tissue in the tumor bank were included. According to the WHO 2007 classification, 11 oligodendroglioma (OO) WHO Grade II, 15 anaplastic oligodendroglioma (AO) WHO Grade III, 7 oligoastrocytoma (OA) WHO Grade II, 10 anaplastic oligoastrocytoma (AOA) WHO Grade III, and 7 glioblastoma (GBM) with oligodendroglial component, WHO Grade IV were studied. All tumors were reclassified according to the new classification into OOs, astrocytomas, and GBMs. The patients were followed up until October 2015. Immunohistochemistry was performed manually on formalin-fixed paraffin-embedded tissue using monoclonal antibody against IDH1R132H on all 50 cases at 1:30 dilution (Dianova, antimouse antibody, clone H09). ATRX immunohistochemistry (IHC) was performed using the Ventana Benchmark GX immunostainer on the same block as was used for IDH using a monoclonal antibody obtained from Sigma Aldrich at 1:300 dilutions (Cat No. HPA001906). Negative immunostaining was considered as loss of ATRX expression. Fluorescent in situ hybridization (FISH) was used to determine 1p/19q status on all 50 cases. A representative slide and its block were selected for FISH. Dual-color FISH assays were performed on 3 micron-thick tissue sections, as previously described. DNA was extracted from fresh frozen tumor tissue using DNA tissue extraction kit from Qiagen as per the manufacturer's instruction. The DNA was quantitated using the Nanodrop (NanoDrop Technologies, USA). The extracted DNA was used for determining IDH1 and IDH2 mutations using direct sequencing. A fragment of 248 bp spanning the catalytic domain of IDH1, including codon 132, was amplified using forward primer 5'-CTCCTGATGAGAAGAGGGTTGT-3’ and reverse primer 5'-TGGAAATTTCTGGGCCATG-3’. Similarly, a fragment of 227 bp spanning the catalytic domain of IDH2 was amplified using forward primer 5'-TGGAACTATCCGGAACATCC-3’ and reverse primer 5'-AGTCTGTGGCCTTGTACTGC-3’. Statistical analysis was performed using the “Statistical Package for the Social Sciences (SPSS) software,” Windows, version 16. The association between 1p/19q deletion, polysomy 1/19, IDH1/2 mutation, and ATRX mutation with various clinical, radiological, and histopathological parameters was done using chi-square test/Fisher's exact test. Only primary tumors (42 cases) were included for survival analysis. Kaplan–Meier survival estimate was used to plot the survival curves for recurrence, and the log-rank test was used to determine the level of statistical significance. Two-sided Fisher's exact test was used to measure the significance in univariate analysis. Multivariate analysis was done with Stata 11.2 using a Cox regression model. For all statistical analysis, a P value ≤0.05 was considered significant. The median age of patients in our cohort was 39 years (range 13–63 years). The median ages of WHO Grade II, III, and IV tumors were 38, 39, and 42 years, respectively. More than two-thirds of the cases were males. According to the new classification, there were 6 WHO Grade II OOs, 14 WHO Grade III AOs, 12 WHO Grade II astrocytomas, 11 WHO Grade III anaplastic astrocytomas (AA), and 7 WHO Grade IV GBMs. 30% of the cases previously diagnosed as OOs (WHO Grade II/III) were reclassified as astrocytomas based on the algorithm proposed by Reuss et al. Among the OAs (WHO Grade II/III), 88% were reclassified as astrocytomas and the remaining as OOs [Figure 1]. IDH1/2 mutations were seen in 46 of the 50 cases. All the four negative cases were primary GBMs. Two of the three IDH mutant GBMs were secondary GBMs, as evidenced by a previous surgery for a glioma [Figure 2]. The most common mutation identified was IDH1R132H (42/50 cases). One OO showed an IDH1R132C mutation. Three AOs showed the IDH2 mutations, all of which were of the IDH2 R172K type. Immunohistochemistry (IHC) for the IDH1R132H mutant protein was positive in all the 42 cases showing the same mutation. All cases showing other types of mutations and the IDH wild-type status were shown to be negative by IHC. The overall sensitivity and specificity of IHC to detect IDH1/2 mutations was, therefore, 91.3 and 100%, respectively. 1p/19q co-deletion was seen in all 20 OOs. Among the astrocytomas, one case showed only 1p deletion and four cases showed only 19q deletion. 1p/19q co-deletion was significantly associated with the frontal lobe location (P = 0.003). All the four GBM cases that were negative for IDH1/2 mutation were also negative for 1p/19q co-deletion. Polysomy of chromosome 1 or 19 was seen in 18 cases (36%) and was significantly associated with an astrocytic lineage (P ≤ 0.001) with 17/30 astrocytic tumors showing polysomy of chromosome 1 or 19. Only one OO with co-deletion of 1p and 19q also showed polysomy of both chromosome 1 and 19 [Figure 3]. Loss of ATRX expression was seen in 24 of 50 cases, 87% (20/23) of WHO Grade II and III astrocytomas and 4 of 7 GBMs showed loss of expression. The latter included two secondary GBMs [Figure 2]. 1p/19q deletion and ATRX mutations were mutually exclusive in all cases. The three cases of astrocytomas (1 WHO Grade II and 2 WHO Grade III) which had preserved expression of ATRX did not show 1p/19q co-deletion and hence were classified as astrocytomas. These three tumors had an oligodendroglial morphology and two of them also showed 19q deletion. All 20 oligodendrogliomas, all 23 astrocytomas, and 3/7 GBMs were IDH1/2 mutant. ATRX expression was significantly associated with IDH1/2 mutation in astrocytic tumors (P = 0.01). The three cases of GBM that lacked ATRX mutation were all IDH wild-type. Follow-up information was available for all 50 cases. The duration of follow-up ranged from 3 months to 78 months (median 48 months). Eight cases had recurrent tumors at the time of presentation and were excluded from the survival analysis. The median duration of follow-up for the patients with the remaining 42 tumors was 46 months. Thirteen out of 42 patients had a recurrence and 8 patients died at the end of follow-up period. Of the 13 recurrent tumors, there were 4 WHO Grade II astrocytomas, 5 WHO Grade III tumors (2 AA and 3 AO), and 4 WHO Grade IV tumors (GBMs). Of the 8 patients who died during the follow-up period, there was 1 case of WHO Grade II astrocytoma (died due to other causes), 3 cases of WHO Grade III (2 AOs and 1 AA), and 4 cases of WHO Grade IV tumors. The median survival time was 20.3 months for WHO Grade IV tumors. The median survival time was not reached for WHO Grade II and III tumors. According to Kaplan–Meier survival estimate for recurrence and death, WHO Grade IV tumors were found to have a significantly worse progression-free survival (PFS) and overall survival (OS) than the combined category of WHO Grade II and III tumors (P ≤ 0.0001). There was no significant difference in recurrence or death between WHO Grade II and III tumors [Figure 4]. On univariate analysis, the WHO grade (Grade IV versus Grade II and III), necrosis, and microvascular proliferation were associated with an increased risk of recurrence, while the WHO grade (Grade IV versus WHO Grade II and III), absence of IDH mutation, necrosis, and microvascular proliferation were associated with an increased risk of death [Table 1]. On multivariate analysis, using the WHO grade, absence of IDH1/2 mutations and histology (pure oligodendroglial versus astrocytic), only the WHO grade (Grade IV versus Grade II and III) was associated with an increased risk of recurrence and death (P = 0.016 and P = 0.02, respectively) [Table 2] and [Table 3]. The significant difference in prognosis and response to chemotherapy between oligodendroglial and astrocytic tumors has always been an impetus to an accurate discrimination of these entities. Though classical oligodendrogliomas or astrocytomas seldom posed diagnostic difficulties, those tumors which showed ambiguous features were challenging to diagnose and categorize, and were often loosely classified as OAs. The current molecular data show that, though histologically ambiguous, these tumors are genetically clonal, showing features of either an oligodendroglioma or an astrocytoma, and rarely both. 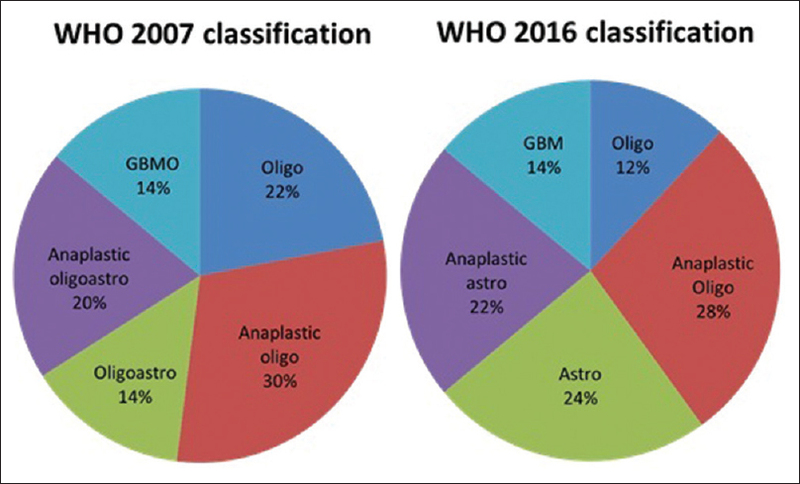 The current updated WHO 2016 classification integrates both phenotypic and genotypic parameters, thus adding a level of objectivity to the diagnosis. It is believed that this will yield more biologically homogenous and narrowly defined diagnostic entities than have been defined in the previous classifications. In the present study, we found a high frequency of IDH1/2 mutations. All oligodendrogliomas, astrocytomas, and three of the seven GBMs showed the IDH1/2 mutation. Though the frequency of mutations in our study was found to be higher than the globally represented numbers, some studies have demonstrated a similar rate of occurrence.,,, In an Indian study by Thota et al., conducted at a center in South India, the frequencies of IDH1 mutations were found to be 100% in diffuse astrocytomas, 92.9% in anaplastic astrocytomas, and 83.3% in secondary GBMs. Four rare IDH1 and IDH2 mutations (1 IDH1R132C and 3 IDH2R132K) were also seen in the present study. All the three IDH2 mutations in our study were seen in AOs. Studies have shown a positive correlation between the IDH2 mutations and the oligodendroglial component. There is only one other Indian study which has described these rare IDH1/2 mutations. We found a good correlation between the IDH1R132H mutation and protein expression by IHC. The high sensitivity and specificity of IDH1 IHC makes this a simple and cost-effective laboratory technique. It can be used to differentiate tumor cells from reactive gliosis, and to differentiate oligodendrogliomas/astrocytomas from other glial neoplasms such as ependymomas or pilocytic astrocytomas on histological sections. One potential pitfall is the inability to detect other types of IDH1/2 mutations. Hence, a subgroup of gliomas with a favorable prognosis can be missed if only IHC is used to detect the mutational status. As about 10–15% of IDH mutant cases are immunonegative, WHO recommends the use of IDH1/IDH2 sequencing on all immunonegative cases before the diagnosis of an IDH wild-type is made. IDH1 immunonegative tumors should be called astrocytoma/oligodendroglioma, not otherwise specified (NOS), respectively, when IDH1/2 sequencing cannot be done to rule out the presence of other mutations. Several studies have shown that IDH wild-type gliomas have a significantly worse prognosis than the IDH mutant tumors.,,,,,,, An integrative genomic analysis of diffuse gliomas conducted by The Cancer Genome Atlas More Details Research Network found that the majority of WHO Grade II and III gliomas with wild-type IDH showed a remarkable genomic and clinical similarity to the primary (wild-type) GBMs. The prognosis of these tumors was intermediate between the IDH wild-type GBMs and the IDH-mutated GBMs. In the present study, survival analysis showed that Grade IV GBMs had a significantly worse prognosis when compared to WHO Grade II and III diffuse gliomas. There was, however, no statistical difference in the progression free survival (PFS) and overall survival (OS) between WHO Grade II and III tumors. Some recent studies have shown that the IDH mutant WHO grade II and III gliomas have little difference in survival and have a similar age at presentation., The median age at presentation of WHO Grade II and III tumors in our study was also similar (38 and 39 years, respectively). The high percentage of IDH mutant tumors in our study could have accounted for the absence of significant difference between WHO Grade II and III tumors. Also, the median survival time was not reached for WHO Grade II and III tumors in our cohort. As IDH mutant tumors have a better prognosis, these tumors need to be followed up for a longer duration. The pattern of 1p and 19q deletion is also important and is different in OOs and astrocytomas. While the combined loss of the whole arm of chromosome 1p and 19q is specific and characteristic of OOs, partial interstitial deletion of 1p or 19q, commonly involving regions 1p36 or 19q13, is seen in astrocytic tumors. Studies have shown that the whole arm 1p or 19q deletion is associated with a good prognosis.,, According to WHO 2016, only tumors that show a combined deletion of 1p and 19q are classified as OOs, and tumors with retained ATRX expression that show either 1p or 19q deletion alone are classified as astrocytomas. In our study, we had two such tumors which showed a retained ATRX expression but had 19q deletion. Both these tumors had a distinct oligodendroglial morphology on microscopy. Whether these tumors represent true OOs or astrocytomas needs to be confirmed by further studies. Polysomy of chromosome 1 or 19 is a risk factor that may be responsible for an unfavorable outcome. Jiang et al., found that this polysomy is more commonly found in mixed tumors than in pure oligodendroglial or astrocytic tumors, and is found less frequently in low-grade tumors. Snuder et al., showed that polysomy for chromosomes 1 and 19 in AOs with combined 1p/19q loss predicts an earlier recurrence. Further studies have shown that irrespective of the tumor grade, the polysomy of chromosome 1 and/or 19 in 1p/19q co-deleted tumors is associated with a shorter OS and PFS.,,, In the present study, we found polysomy of chromosome 1/19 in 18% of cases and it was significantly associated with astrocytic tumors. Though we did not find any significant effect on survival, polysomy 1/19 may be an indicator of astrocytic lineage. The significance of polysomy 1/19 needs to be further studied. One of the major drawbacks of the new WHO 2016 classification is the cost factor involved in molecular testing, which makes its universal implementation in economically backward countries difficult. The growing availability of immunohistochemical surrogates for IDH1 mutation and ATRX expression helps to address this issue. The term diffuse glioma, NOS has been recommended for such cases that cannot be tested. The present study was in progress during the formulation of the new guidelines. Our cohort of cases, albeit small, reiterates the robustness of IHC for detection of IDH1 mutations. The findings in this study are in agreement with the recommendations of the WHO for the use of IDH1/IDH2 sequencing only for IDH1 immunonegative cases. We acknowledge the kind help provided by Mrs Janet Paul and Mrs Sunitha Robinson from the Neuropathology laboratory in the preparation of tissue sections and immunohistochemistry. The work was funded by Institutional research grant (IRB Min. No. 8246, dated 19/3/2013) of the Christian Medical College, Vellore. Reuss DE, Sahm F, Schrimpf D, Wiestler B, Capper D, Koelsche C, et al. 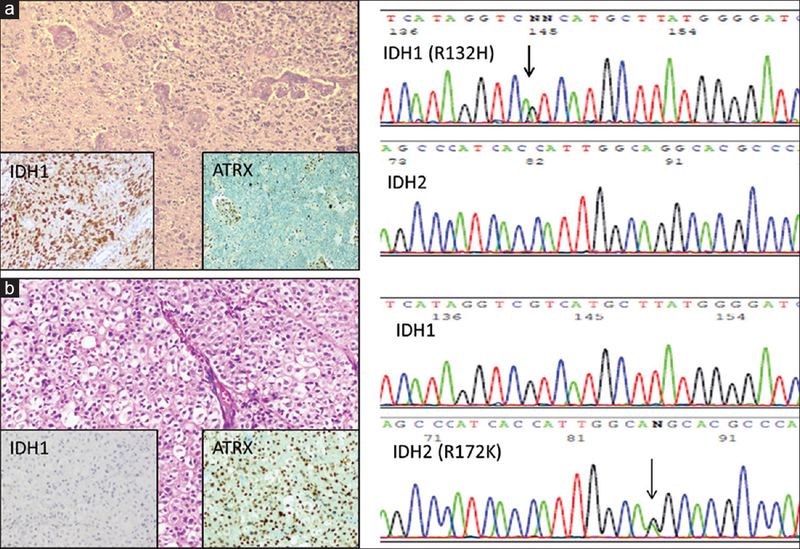 ATRX and IDH1-R132H immunohistochemistry with subsequent copy number analysis and IDH sequencing as a basis for an “integrated” diagnostic approach for adult astrocytoma, oligodendroglioma and glioblastoma. Acta Neuropathol (Berl) 2015;129:133-46. Wiestler B, Capper D, Holland-Letz T, Korshunov A, von Deimling A, Pfister SM, et al. ATRX loss refines the classification of anaplastic gliomas and identifies a subgroup of IDH mutant astrocytic tumors with better prognosis. Acta Neuropathol (Berl) 2013;126:443-51. Haberler C, Wöhrer A. Clinical Neuropathology Practice News 2-2014: ATRX, a new candidate biomarker in gliomas. Clin Neuropathol 2014;33:108-11. Cancer Genome Atlas Research Network, Brat DJ, Verhaak RG, Aldape KD, Yung WK, Salama SR, et al. Comprehensive, integrative genomic analysis of diffuse lower-grade gliomas. N Engl J Med 2015;372:2481-98. Parsons DW, Jones S, Zhang X, Lin JC, Leary RJ, Angenendt P, et al. An integrated genomic analysis of human glioblastoma multiforme. Science 2008;321:1807-12. Louis DN, Perry A, Reifenberger G, von Deimling A, Figarella-Branger D, Cavenee WK, et al. The 2016 World Health Organization classification of tumors of the central nervous system: A summary. Acta Neuropathol (Berl) 2016;131:803-20. Louis DN, Perry A, Burger P, Ellison DW, Reifenberger G, von Deimling A, et al. International Society of Neuropathology—Haarlem consensus guidelines for nervous system tumor classification and grading. Brain Pathol Zurich Switz 2014;24:429-35. Rajmohan KS, Sugur HS, Shwetha SD, Ramesh A, Thennarasu K, Pandey P, et al. Prognostic significance of histomolecular subgroups of adult anaplastic (WHO Grade III) gliomas: Applying the “integrated” diagnosis approach. J Clin Pathol 2016;69:686-94. Singh VY, Chacko G, Chacko AG, Rajshekhar V. Fluorescence in situ hybridization for 1p, 19q status in a cohort of glial neoplasms. Neurol India 2014;62:32-6.
van den Bent MJ, Dubbink HJ, Marie Y, Brandes AA, Taphoorn MJ, Wesseling P, et al. IDH1 and IDH2 mutations are prognostic but not predictive for outcome in anaplastic oligodendroglial tumors: A report of the European Organization for Research and Treatment of Cancer Brain Tumor Group. Clin Cancer Res 2010;16:1597-604. Jiao Y, Killela PJ, Reitman ZJ, Rasheed BA, Heaphy CM, de Wilde RF, et al. Frequent ATRX, CIC, FUBP1 and IDH1 mutations refine the classification of malignant gliomas. Oncotarget 2012;3:709-22. Yan H, Parsons DW, Jin G, McLendon R, Rasheed BA, Yuan W, et al. IDH1 and IDH2 mutations in gliomas. N Engl J Med 2009;360:765-73. Thota B, Shukla SK, Srividya MR, Shwetha SD, Arivazhagan A, Thennarasu K, et al. IDH1 mutations in diffusely infiltrating astrocytomas: Grade specificity, association with protein expression, and clinical relevance. Am J Clin Pathol 2012;138:177-84. Hartmann C, Meyer J, Balss J, Capper D, Mueller W, Christians A, et al. Type and frequency of IDH1 and IDH2 mutations are related to astrocytic and oligodendroglial differentiation and age: A study of 1,010 diffuse gliomas. Acta Neuropathol (Berl) 2009;118:469-74. Takahashi Y, Nakamura H, Makino K, Hide T, Muta D, Kamada H, et al. Prognostic value of isocitrate dehydrogenase 1, O6-methylguanine-DNA methyltransferase promoter methylation, and 1p19q co-deletion in Japanese malignant glioma patients. World J Surg Oncol 2013;11:284. Wick W, Hartmann C, Engel C, Stoffels M, Felsberg J, Stockhammer F, et al. NOA-04 randomized phase III trial of sequential radiochemotherapy of anaplastic glioma with procarbazine, lomustine, and vincristine or temozolomide. J Clin Oncol 2009;27:5874-80. Gravendeel LA, Kouwenhoven MC, Gevaert O, Rooi JJ de, Stubbs AP, Duijm JE, et al. Intrinsic gene expression profiles of gliomas are a better predictor of survival than histology. Cancer Res 2009;69:9065-72. Olar A, Wani KM, Alfaro-Munoz KD, Heathcock LE, van Thuijl HF, Gilbert MR, et al. IDH mutation status and role of WHO grade and mitotic index in overall survival in grade II-III diffuse gliomas. Acta Neuropathol (Berl) 2015;129:585-96. Houillier C, Wang X, Kaloshi G, Mokhtari K, Guillevin R, Laffaire J, et al. IDH1 or IDH2 mutations predict longer survival and response to temozolomide in low-grade gliomas. Neurology 2010;75:1560-6. Sanson M, Marie Y, Paris S, Idbaih A, Laffaire J, Ducray F, et al. Isocitrate dehydrogenase 1 codon 132 mutation is an important prognostic biomarker in gliomas. J Clin Oncol 2009;27:4150-4. Reuss DE, Mamatjan Y, Schrimpf D, Capper D, Hovestadt V, Kratz A, et al. IDH mutant diffuse and anaplastic astrocytomas have similar age at presentation and little difference in survival: A grading problem for WHO. Acta Neuropathol (Berl) 2015;129:867-73. Vogazianou AP, Chan R, Bäcklund LM, Pearson DM, Liu L, Langford CF, et al. Distinct patterns of 1p and 19q alterations identify subtypes of human gliomas that have different prognoses. Neuro Oncol 2010;12:664-78. Bent MJ van den, Brandes AA, Taphoorn MJ, Kros JM, Kouwenhoven MC, Delattre JY, et al. Adjuvant procarbazine, lomustine, and vincristine chemotherapy in newly diagnosed anaplastic oligodendroglioma: Long-term follow-up of EORTC brain tumor group study 26951. J Clin Oncol 2013;31:344-50. Cairncross G, Berkey B, Shaw E, Jenkins R, Scheithauer B, Brachman D, et al. Phase III trial of chemotherapy plus radiotherapy compared with radiotherapy alone for pure and mixed anaplastic oligodendroglioma: Intergroup Radiation Therapy Oncology Group Trial 9402. J Clin Oncol 2006;24:2707-14. Jiang H, Ren X, Zhang Z, Zeng W, Wang J, Lin S. Polysomy of chromosomes 1 and 19: An underestimated prognostic factor in oligodendroglial tumors. J Neurooncol 2014;120:131-8. Snuderl M, Eichler AF, Ligon KL, Vu QU, Silver M, Betensky RA, et al. Polysomy for chromosomes 1 and 19 predicts earlier recurrence in anaplastic oligodendrogliomas with concurrent 1p/19q loss. Clin Cancer Res 2009;15:6430-7. Ren X, Jiang H, Cui X, Cui Y, Ma J, Jiang Z, et al. Co-polysomy of chromosome 1q and 19p predicts worse prognosis in 1p/19q codeleted oligodendroglial tumors: FISH analysis of 148 consecutive cases. Neuro Oncol 2013;15:1244-50. Wiens AL, Cheng L, Bertsch EC, Johnson KA, Zhang S, Hattab EM. 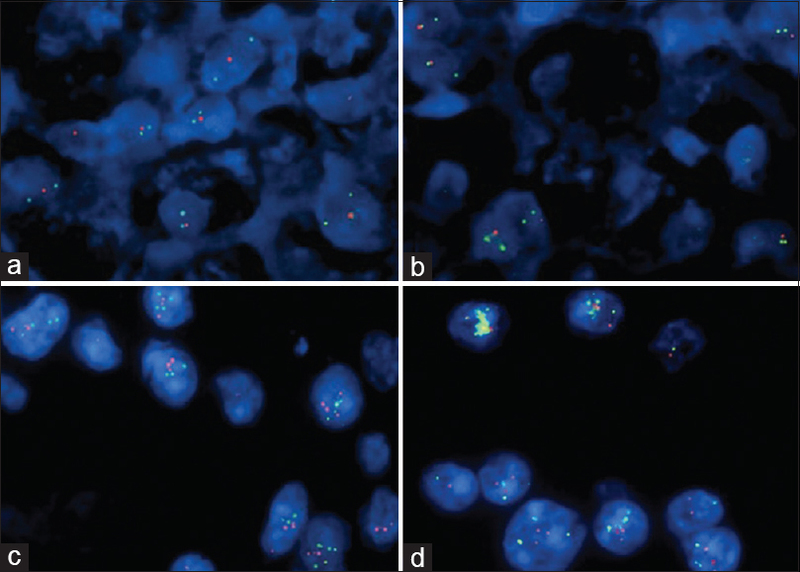 Polysomy of chromosomes 1 and/or 19 is common and associated with less favorable clinical outcome in oligodendrogliomas: Fluorescent in situ hybridization analysis of 84 consecutive cases. J Neuropathol Exp Neurol 2012;71:618-24.